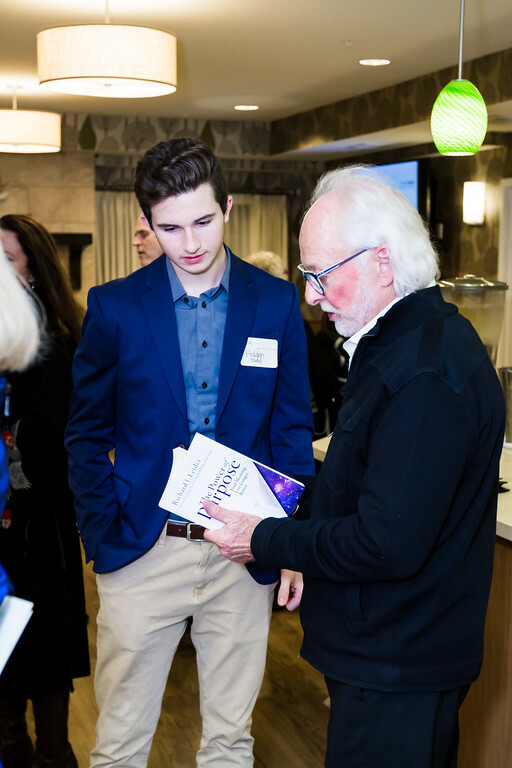 Center for Purposeful Leadership hosted its first reception to convene and connect with 50+ colleagues and introduce the CPL Team. 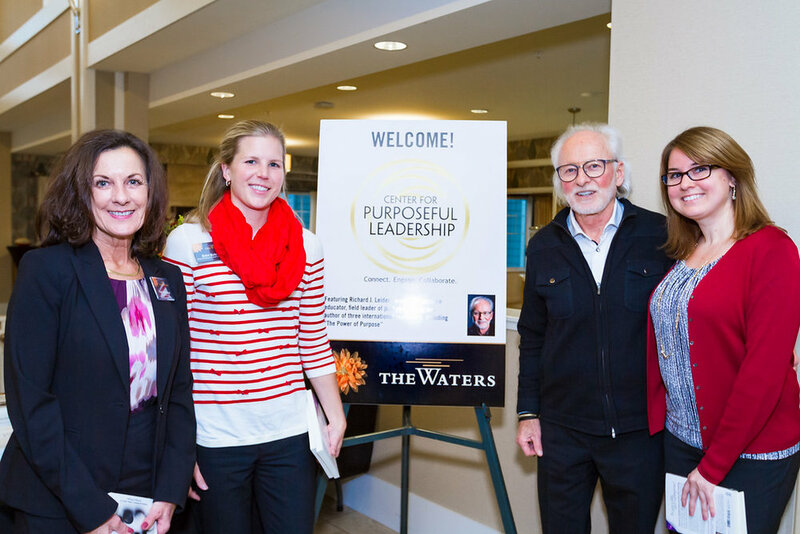 Purpose leader Richard Leider spoke on the Purpose Movement and current research. We were hosted by The Waters Senior Living leadership at The Waters on 50th. Gathering with so many thought leaders truly shows the great direction purposeful leadership is headed. In a new series, Center for Purposeful Leadership provides guest blog posts from our Purpose Fellows. 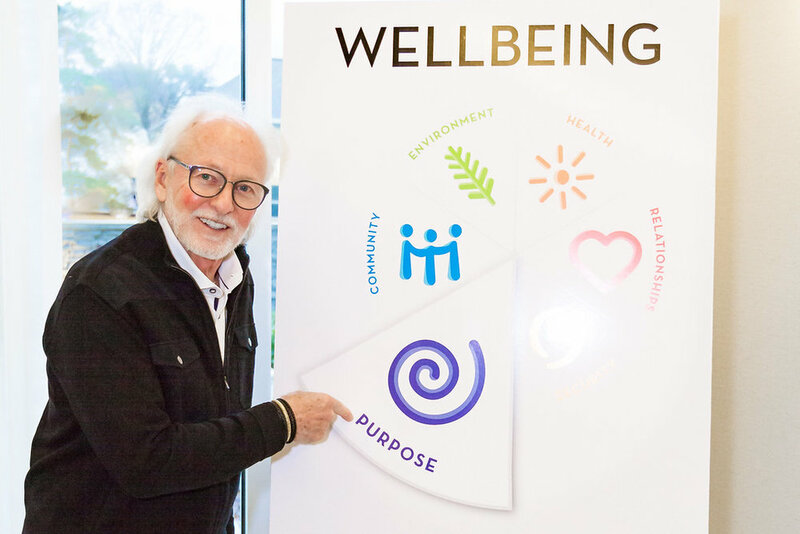 We are pleased to present the first post from renowned purpose coach Richard Leider. What are we to do to survive and thrive in this volatile, uncertain, complex, ambiguous environment? (VUCA) The mere fact that we have to ask that question is unsettling. Many of us did not anticipate that we’d be living in that question, daily, at this point in our lives. We prepared hard for a future we expected. And, yet, when it comes to our work lives today, we find that it’s the end of work as we know it. Laid off? Under-employed? Feeling stuck in your current position? Working worried? This is not how we envisioned that it was going to be. Our careers today rarely are that certain. Why the disconnect between what we hoped would happen, and what is actually happening? The answer is simple – a VUCA world requiring new life skills to navigate it. The way I was taught to think and act works well when the future is predictable. But, not so much in the VUCA world as it is now. In transition times, we tend to knock any abstract thinking about our work lives as a luxury we cannot afford. The emphasis is to stay employed no matter the personal toll it’s taking on us. It’s pretty scary when you cannot plan and control your destiny, let alone the work you want. "In a world where we can no longer be secure or certain, how can we find some sense of certainty? If we want to play in the new work game, as it is now, we have to change our mindset." This simple phrase has changed the way I relate to uncertainty. Freedom “to” means awakening to the truth of what’s happening in both our inner and outer worlds and then acting on what is happening with our own deeper wisdom or our guide. While everything outside seems to be shifting, what remains unchanging is what we know inside – our core purpose, values, and beliefs. 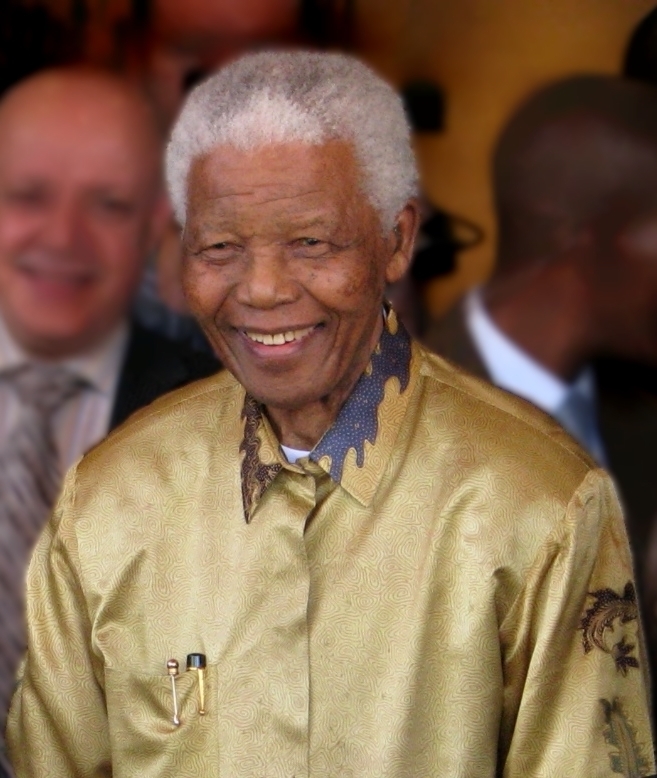 Freedom “to” means staying fiercely aware and protective of that which is most important to lead a life of substance. Freedom “to” is about taking back the steering wheel of our lives and refusing to become VUCA’s passenger limping along aimlessly as we hear the daily sirens signaling bad news. So, how do we wake up from being asleep at the wheel? Purpose provides the bones for the body of life – the human story. What I observe in my coaching practice is that many people, today, feel increasingly disconnected from a sense of context, meaning, and the greatest human narrative. They speak of being too busy, hurrying too much, and not knowing what their lives are supposed to be about. They are desperate to feel connected to some purposeful certainty, something more lasting than their momentary dramas and distractions. The ceaseless activity creates a feeling of shallowness. Instant and trivial is how it is – the opposite of grounded purposefulness. They hope their real lives will one day have the certainty that real life is supposed to carry, yet, is slipping away. It’s critical to take hold of the steering wheel. To reflect on life. To consider where we fit into the larger human story and what purpose our individual and shared journeys holds. The VUCA world can change radically in a short span of time. But what is 100% certain is what’s valuable and important to you. Who are you? What matters to you? What is “calling” you to be your best self? So, how do you grab the steering wheel and get started on concrete actions that are consistent with your desires? How do you find core certainty in uncertain times? How do I know this approach will work? Because it already has. The process works “if” you work the process. After reading this, you probably feel a bit overwhelmed because it seems like a lot of work. Want to know why you feel this way? Because it is a lot of work. Creating your life the way you want so that you feel a sense of certainty from it requires a commitment to yourself to take actions every day. There are no magic buttons or pills that will get you there. Choice #1: You can continue on the path you are on right now. There is nothing wrong with going this route. However, this path is very uncertain. Choice #2: You can grab the steering wheel and begin the What Works practices which will help you speed up the process so you can get where you want to go much faster. Whatever choices you make today will affect where you will be in your life one year from now because it takes that long for you to see the results of your practices! "Purpose. A hard word to define, perhaps. It may not have a name or a face. We may not immediately see it as purpose, but it is there. And, Patricia and Craig saw it, named, and have worked it with grace and integrity for the past 20 years! They have held the center on the art and science of "convening with purpose". And, that has helped many of us to be confidently connected with something larger than our own lives." "Many, many books come across my reading table each year, but it has been a long time since one of them affected me as much as this one has. It has struck some deep chords within me. It has reminded me that each gathering is a sacred adventure where even our struggles can lead us to what mythologist Joseph Campbell called “the rapture of being alive.” You hold in your hands a wise book." If you are wanting to convene with purpose in your own life, you can learn and lead with grace by reading and reflecting on the 9 chapters of The Art of Convening book. Convene with purpose in your next meeting. Move beyond facilitation to profound connection. Using the Art of Convening, transform your meetings, boost ROI, and retain your best people. Give us a jingle at 612.920.3039 to get started. Follow us on our LinkedIn page to receive helpful tips on the art of convening. We’ve all had those moments of awakening or remembering, some fleeting as if from a dream, where we know and feel connected in a visceral sense to all things, human and otherwise. Then, most of us return to the “real world” where day-to-day life resumes. What if these moments were the reality in which we were born to live, and that what if these episodes are the great remembering of what it truly is to be human? 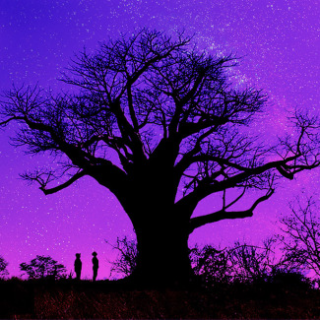 My recent trip to east Africa, the birthplace of humanity, was one such moment in time, when the journey to a far off place brought forward a deep remembering of innocence, and connection to all things. Craig's connection to the land and the people who have inhabited and known the land for over 4000 years was ground-shaking for him because it brought him squarely to the question of being, remembering, connection. What is it you wish to remember about who you are, why you are here, and to whom or what you belong?